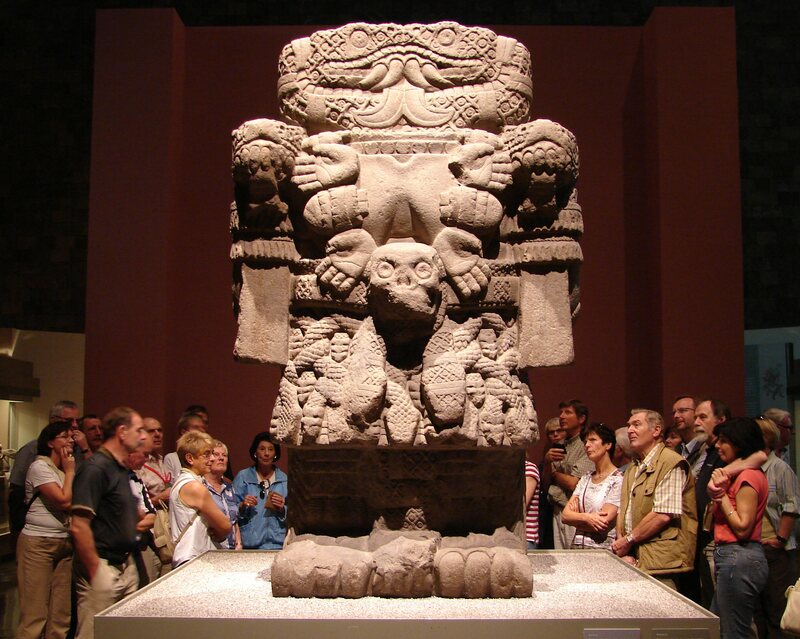 Standing today in the Museo Nacional de Antropología, Coatlicue astonishes us first by her sheer size. The colossal statue is some three meters high and 1.5 meter broad. It weighs somewhere between two and ten tons (significantly, even the academics can’t agree). Then, emotions arise in the viewer: one observer might be amazed at the sculptural craftsmanship, while another might be repulsed at the violent images that configure her body, because we stare at the goddess in her most terrible form. She is dressed in the skin of a flayed woman. In the front her severed head is replaced by two large snakes (representing flowing blood). Kissing each other, they form a hideous face. She wears a necklace of severed human hands and hearts with a large skull pendant. Her skirt is composed of entwined snakes, while her hands and feet have the large claws she uses to rip up human corpses before she eats them. The legs of the sculpture are covered in decorative designs akin to ornamental regalia with geometric motifs. A cluster of eagle plumes lead to the feet that are sculpted to form a monstrous motif. It can be seen in the stylized eyes on the top of the feet and talons that also function as fangs for the instep. 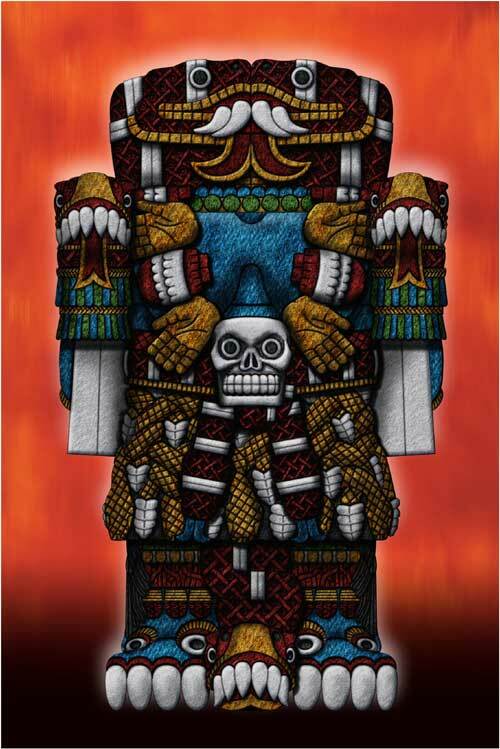 At her back her hair hangs down in 13 tresses symbolic of the 13 months and 13 heavens of Aztec religion. Her shoulders, feet and elbows are depicted as fanged monsters. The hands are snakes that mimic those of the head and appear to be claws when viewed from the front. The sculpted human skull fastened to the figure’s belt in the center of the back attaches to two layers of straps made in the likeness of rattlesnake ends. Mystery upon mystery: the revolting imagery is somewhat balanced by her human breasts, which sag in a manner that suggests she has given birth and breastfed. And the serpent lodged between her legs: does it indicate that she is also a he? How much more impact would it (like those of Greek antiquity) have had when painted – as it originally was – with the most violent colors? …just as it did four hundred years ago, the statue both attracts and repels us, producing both seduction and horror…the enigma of the block of stone paralyzes our sight. The exact nature of the sensation that overcomes us in this moment of stillness is unimportant: admiration, horror, enthusiasm, curiosity. Without ceasing to be what we see, the work of art once more reveals itself as that which lies beyond what we see…she is a concept turned to stone. If the concept is one of terror—in order to create, the earth must devour—the form through which it is expressed is an enigma: each attribute of the deity…is represented in realistic style, yet the totality is an abstraction. The Coatlicue is at the same time a charade, a syllogism, and a presence that condenses within it a mysterium tremendum. …after you have seen her, it is unthinkable that the mother of the gods could be expressed in any other way. There is nothing warm or consoling about her. She does not invite caresses and she is wholly absorbed in her own affairs: imperturbable and final. She is death, and out of her womb there flows an abundant life. The function of art is to open the doors that connect us to the other side of reality…Movement is dance, the dance is a play, and the play is the war of creation and destruction. Mankind is not at the center of this game…tied to the turning cosmic wheel, (he) is a toy in this cruel game played by the gods, a game that revolves around the single obsessive theme of creative sacrifice. Nevertheless, it is precisely for this reason that mankind is the axis of the universe; each and every act, all of his works, are rituals or prayers that nourish the hungry gods. Without human blood, life would cease to flow and the universe would come to a halt. This view of the world and of mankind is the exact opposite of our modern conception, which sees nature as an enormous reservoir of energy and resources that the human race can dominate and exploit with impunity…The civilization of Mesoamerica is an example of the reconciliation of man with nature, even with its more terrifying aspects. It is a lesson in solidarity with the universe. We view her amid the great crowds in the cool, refined atmosphere of one of the world’s great museums. Schoolchildren titter; adolescents pose in front of her; tourists listen to their audio guides, scan their programs and move on. Few take the time to feel this profoundly disturbing presence: disturbing because of the obvious horror implied. But she is equally disturbing because of the deep sorrow and longing that might also arise, and the hunger for a life in which such a ritual imagination might still flourish. She was twice reburied for these reasons. Next: Does she still live?